Call 732-734-4954 to schedule your first appointment. If you suffer from hearing loss, come to Miracle-Ear® for hearing aids in Brick, NJ. We're America's most recognized brand of hearing aids. With more than 70 years of experience, we’ll be able to provide the level of quality and service that you’d expect from a first-rate company. Are You Wondering If You Have Hearing Loss? Getting a hearing checkup will be beneficial to protect your hearing and overall health. When you become a Miracle-Ear customer, you’ll get to take advantage of our free hearing tests** and hearing repair services for the life of your hearing aids. Our modern equipment and dedicated hearing care specialists make it possible for us to provide you with the highest quality of service. Get to know our new GENIUS™ Technology, which provides better speech recognition and enhanced natural sound quality. Our technology platform provides a personalized listening experience and will also deliver better sound quality to suit your needs and preferences. We’ve helped customers at our more than 1300 locations nationwide restore their ability to easily listen and communicate effectively. The experienced hearing care specialists at our hearing aid center in Brick will be happy to work with you and help you find the best match for your needs. Discover and experience the Miracle-Ear® advantage. Call or visit us today to schedule an appointment and to learn more about our hearing aids and lifetime services. 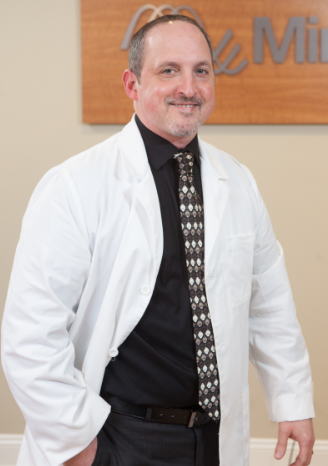 Michael is a Hearing Instrument Specialist in our Brick, NJ location. Michael has 19 years of experience and he Is nationally board certified. Michael's favorite part of working at Miracle-Ear is helping people who have put getting help off for too long and seeing the gratitude of their families. As a background, I am a 74 year-old male and still actively involved in my business and having just gotten my 2nd set of hearing aids, I have found they have opened up a whole new world for me. With that being said, my hearing loss was progressive as my father had a tree service business and using has chain saws it was not ever mentioned that we should’ve been using hearing protection. As such, my hearing got to the point that my wife “DRAGGED” me in to have my hearing checked 7 years ago and she bought me my first set. Jump forward from then to about two months ago and it was me that had my hearing rechecked with Michael and upon his recommendation, I bought my 2nd set of hearing aids. With the advanced technology and being able to use my cell phone wirelessly I have become acutely aware of all the sounds that I have been missing and asked for Michael’s recommendation. The cost for many obviously is a challenge for many of us, but the quality of life I feel has made it a great investment and I’m loving the sounds and experience of LIFE that I have been missing.